When disasters strike, local communities are the first to try and safeguard their cultural heritage, however their ability to intervene is often greatly reduced during complex and multi-faceted humanitarian crises. At the same time, first responders may not always be aware of what is culturally important, and they often lack the training to handle heritage objects and structures, and meet the specific needs those who bear traditional knowledge. The First Aid to Cultural Heritage in Times of Crisis Handbook is a two-part publication created for the various actors involved in an emergency. It provides a practical method and a set of ready-to-use tools for securing endangered cultural heritage, both tangible and intangible. The user-friendly workflows help readers to plan and implement coordinated cultural rescue and risk reduction operations that involve local communities, heritage custodians, emergency responders and humanitarians. Written with the key guiding philosophy of ensuring an inclusive attitude and respect for diversity while at the same time interlocking humanitarian assistance with cultural heritage first aid, this resource provides an essential, ethical framework focused on attaining successful outcomes. The cultural heritage First Aid workflows and methodologies have been field tested in Haiti, Iraq, Syria, Nepal, Philippines and India, yet this is the first time they have been codified into a comprehensive tool that is accessible to anybody. 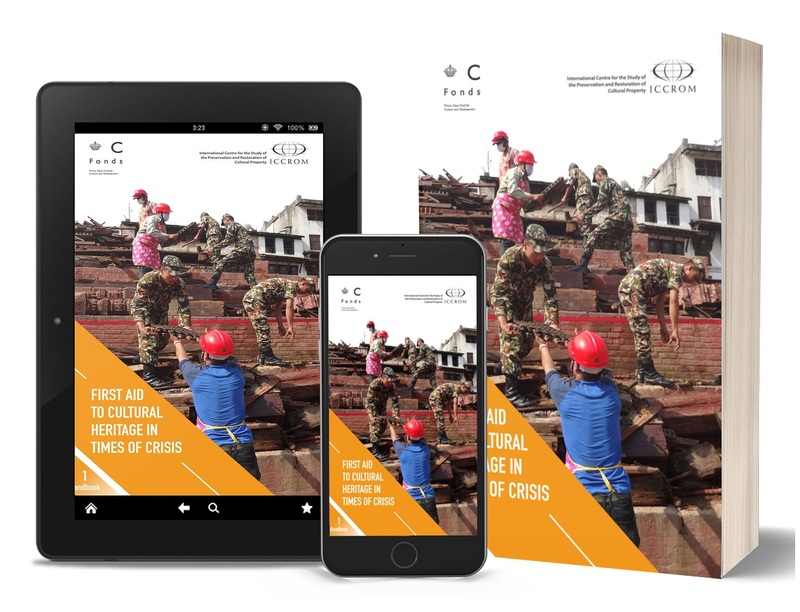 The First Aid to Cultural Heritage in Times of Crisis Handbook and Toolkit is the outcome of nearly a decade of field experience gained by ICCROM, and a close partnership between ICCROM, the Prince Claus Fund and the Smithsonian Institution. It has been developed to answer to the increasing need for cultural heritage and humanitarian aid professionals alike to have a reliable and user-friendly reference that integrates heritage safeguarding into emergency and recovery activities, offering standard operating procedures that are applicable in almost any crisis context. · The Handbook offers step-by-step instructions and real-life case examples. It walks readers through the three phases of cultural heritage First Aid – (1) situation analysis; (2) post event, on-site damage and risk assessment; (3) security and stabilisation, which collectively lead to early recovery. · The phases include workflows and procedures that resemble those followed by emergency responders and humanitarian aid professionals, making in-field coordination possible. · The layout and language is simple and easy to understand. · It is interactive, so you can move quickly through the sections in order to arrive at what you need. · Diagrams, photos and drawings illustrate the text for easy reference. · A glossary and several references allow readers to deepen their understanding of concepts and materials. · The toolkit is rich with checklists, templates and tips that can be customised to any situation. ICCROM is an intergovernmental organization dedicated to the preservation and promotion of cultural heritage worldwide. It works with 136 Member States to ensure the best tools, knowledge, skills and enabling environment to preserve cultural heritage in all its forms, for the benefit of all people. The Smithsonian Cultural Rescue Initiative works to protect cultural heritage threatened or impacted by disasters and to help U.S. and international communities preserve their identities and history.